Melt the butter in pan over medium heat. Add the garlic and cook for about a minute, until fragrant. Add the cream, pumpkin puree, goat cheese, parmesan, sage, and pumpkin pie spice and simmer until the cheese has melted. Remove from heat and season with salt and pepper. 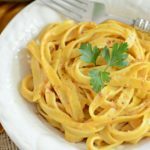 Pour pumpkin alfredo sauce over the cooked fettuccine and stir. Serve immediately and garnish with a pinch of pumpkin pie spice.